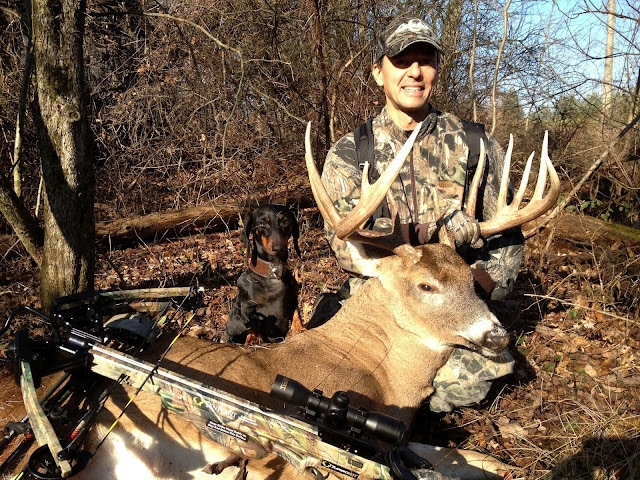 On the morning of Nov. 6th at 8:20 am all the stars aligned for me and God blessed me with this beautiful buck. He was 52 yards and quartering away when I shot him with my dad's crossbow. (I know I was cheating!). At first I thought the arrow went into the front of his right rear leg and forward into his gut. He was bleeding profusely once the arrow hit. He staggered off at a slow walk as he was dragging his right rear leg. I was confident that it was a mortal hit. I waited for half an hour, marked where I found first blood and followed the blood for 20 yards. At that point I decided not to push him so I went home, showered, voted and Michele and I went to lunch. I went back to track him at 2pm with my Dad, and my friends Jeff Mazur and Roger Gudobba. We had really good blood for the first 300 yds. From then it went to a few drops here and there. We found a spot where it had bedded down and two more good puddles at around 600 yards. From this last blood the trail forked in a few directions so we branched out from there, not finding anything else. It was in a real thick area and it was getting later with less light to work with. 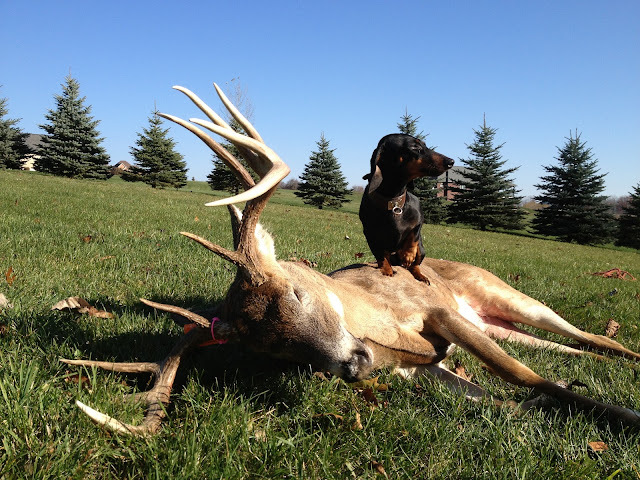 I knew that it was way too nice of a buck to lose so I decided to call Rob Miller from Linden, MI who has a couple of German Dachshunds that are trained to find dead deer. 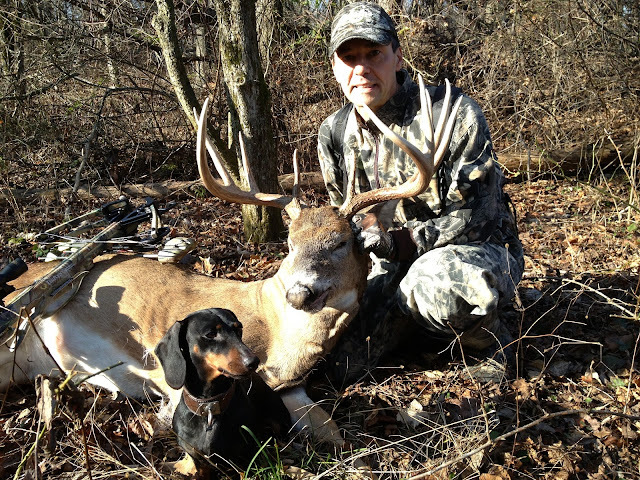 He met Roger and I at 9:00am the following morning and put his dog Syprus on first blood. She sniffed around for a couple minutes, locked on to the scent and started following the blood trail. She followed the exact blood trail we marked the day before. As we approached the last blood the dog found the back part of the arrow with the first four inches broken off which we had not seen the day before. From there she stuck her nose in the air and took off left of the trail into the back yards of a subdivision. Rob worked with her for a minute in a small grassy area and said he smelled a strong odor of buck urine. He walked her back to last blood and off she went to the right of the trail into some really thick thorny briers. Rob immediately said "There is your deer Joe." We were standing 10 yards away from it and still could not see it. How that deer was able to get into there with that rack is beyond me. Needless to say we were all ecstatic. We had been within 10 yards of that deer in total daylight and never saw it. 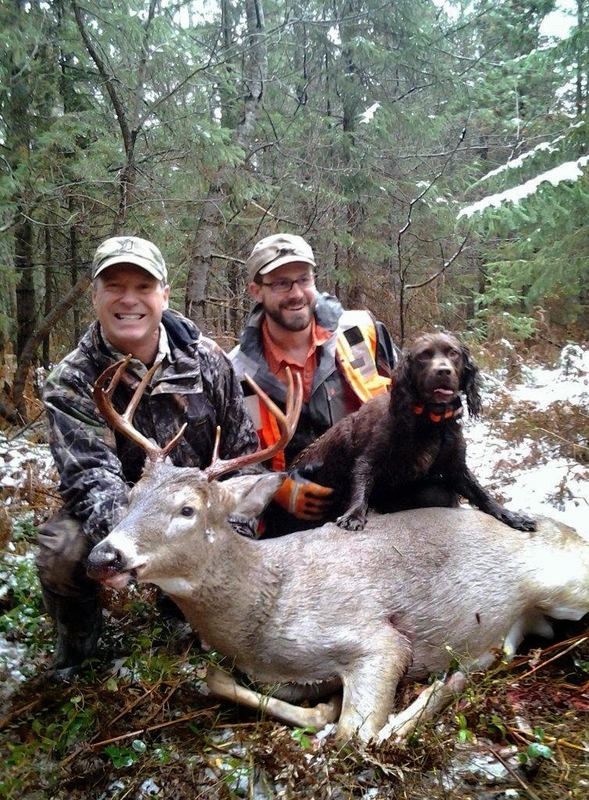 I am thoroughly convinced that without the help of Rob Miller and his dog Syprus that this beautiful buck would never have been found. 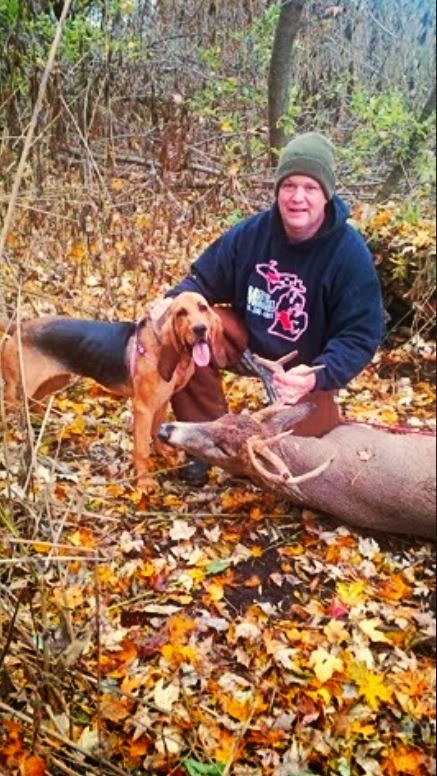 My thanks goes out to Rob, Syprus and everyone else who was involved in recovering this deer. If you have never seen a trained tracking dog work it is truly an amazing experience and well worth the money! I ended up hitting the buck high at the top of the rear leg and severing the main artery that runs along the top of its back. Our total track was .52 miles according to the GPS. My taxidermist (John Lombardo) gross scored the 11 pointer at 165.5" and said it appears to be 5 1/2 years old according to the wear on the teeth. 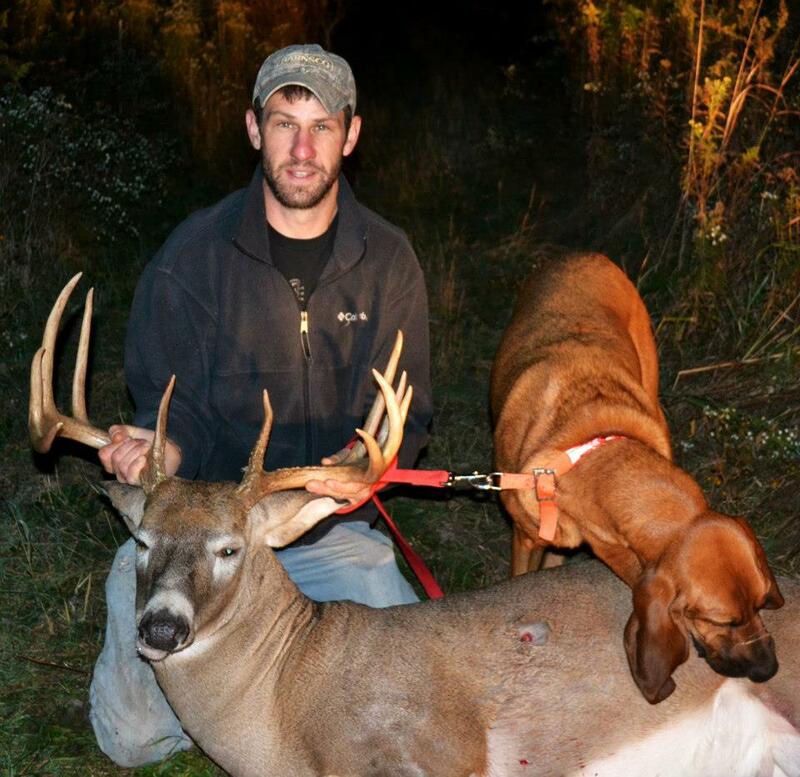 This is truly a once in a lifetime buck!